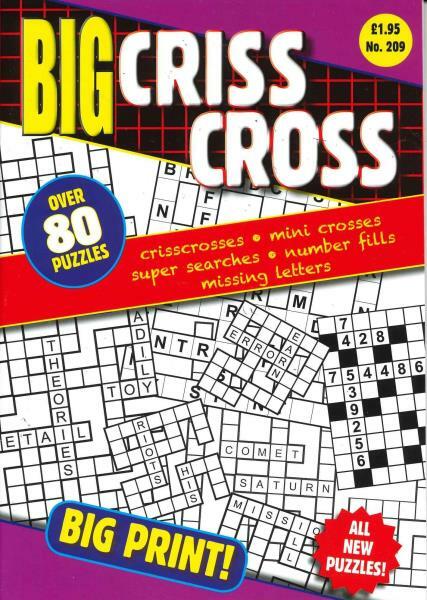 Big Criss Cross has puzzles that are both easy to read and challenging to solve. Criss cross puzzles are a form of crosswords that feature an uncomplicated, asymmetric design. Buy a single copy or subscription to Big Criss Cross magazine. Occasionally, you will see criss cross puzzles with unusual shapes other than the traditional squares. Most criss cross puzzles do not have clues but come with a list of words. You start with a word and then work around it, counting the empty blocks and working the puzzle until you get the words to fit. Doing puzzles like criss cross puzzles and other crossword puzzles are left brain exercises, which can help with keeping brain processes active. It is in the left brain hemisphere where you find analytical and verbal thought. Research has found that doing exercises like brain teasers and crossword puzzles using words and logic to solve puzzles are good for the brain. The brain processes that work to solve puzzles like criss cross puzzles happen predominantly in the left brain. The more you use the left hemisphere of the brain the better it functions. Doing puzzles like criss cross puzzles can also be relaxing and help with your mood according to a variety of research studies. According to recent research, puzzles can increase language skills and the left brain exercises stimulate neurons that increase positive attitudes.